This is the first in a series of articles about how the economy is affecting boating-related businesses in the Cleveland area. Rob Morley, President of Riverfront Yacht Services, located in the Flats, is always hashing up creative business ideas. With the economic downturn, Rob is free associating, thinking outside the box more than usual. The 2009 Bayview Mackinac Race will offer three monohull sailboat rating options and two separate race courses for sailors to increase participation and provide a longer race hoping to attract more of the larger and faster boats, it was announced today. If you think you're busy now, just wait until next week. By the time July ends, Port Huron will have hosted numerous activities, including a carnival, parade, boat week, and an antique and classic car show, just to name a few. Boat week kicks off Monday as downtown Port Huron hosts its annual sidewalk sale with all the downtown businesses invited to participate. The sale is 9 a.m. to 5 p.m. with bargains galore. If you like awesome sailing, extraordinary food, and great drama, this voyage has it all. Like Odysseus of Greek mythology, we'll sail from one legendary island in the Cyclades, and one adventure, to another, visiting the exquisite Mykonos, Tinos, Santorini, Naxos, Ios, and more. We'll wander through spectacular white-washed villages; take walks through picturesque groves of two-century-old olive trees; sail past the dramatic Temple of Poseidon; and explore some of the most important historical sites in the worldâ€”Delos, the Sanctuary of Apollo, Point Sounian, and open-air amphitheaters that have hosted Greek dramas for a thousand years. By Associated PressWork is going well on a new boat for BMW Oracle Racing, the U.S. challenger for the 33rd America's Cup, team officials said. The boat is the third yacht in the history of the sailing race to be built in this town about 100 miles north of Seattle. The multihull yacht is being built for the team from San Francisco's Golden Gate Yacht Club to race for the trophy this year. Janicki Industries in nearby Sedro-Woolley is providing high-technology precision tooling. America's Cup: Life after Cahn. What happens next? The Americaâ€™s Cup again made it to Court on Thursday (NZT). This time one the question of when the Match should be sailed. The arguments have been gone over many times by the PR and legal teams for both sides. However the tough question is what will happen next? Justice Herman Cahn seems to be sticking closely to the Mercury Bay decision â€“ in that the role of the Court is to interpret the Deed of Gift against the actions of the parties â€“ and confirming or denying compliance. Thereâ€™s a new wave in ocean racing, and the Transpacific Yacht Race will ride it to Hawaii in 2009. The TPYC board of directors has posted an Advance Notice of Entry Requirements for the 45th race from Los Angeles to Honolulu next year with two key changes: a maximum length overall (LOA) extended to 30.48 meters (100 feet) for fastest elapsed time or course record contenders and the free use of stored energy for sail hoisting, trimming and adjusting---essentially, ending a Transpac ban on powered winches. A very wet and weary Strewth crew appeared out of the murk at Causeway Bay, Hong Kong, at 1500hrs today, accompanied by the faithful guard ship Cloud, the RHKYCâ€™s Kellett VI, and RIB M69. It was easy to tell which of the two yachts motoring up the harbour was Strewth â€“ the one with the pronounced roll. Just 36 hours earlier she had lost her keel approx 170 nm south east of Hong Kong, en route to Subic Bay in the Rolex China Sea Race 2008. Sarah Steyaert of France has won the 2008 Women's Laser Radial World Championship after a sensational finish to the regatta when Lijia Xu of China was disqualified from the final race ultimately costing her the world title. 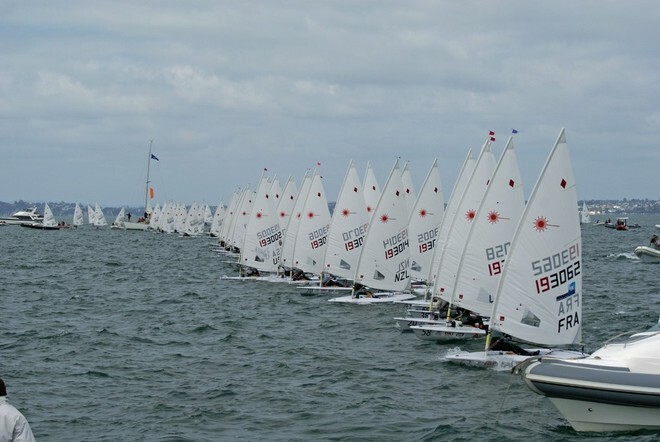 The six day regatta concluded off Takapuna, North Shore City, Auckland today. Steyaert had an excellent day on the water, lying third at the start of the day she won race nine of the championship this morning and then placed 5th in the final race which was enough to secure her the title. It is Steyaert's first ever world title and far and away her best World Championships result, her previous best being a 6th place in 2006. Points table after three races in the 2008 Womens Laser Radial Championships, Takapuna, New Zealand. DHL, the world's leading express and logistics provider, has been named Official Logistics Partner for the RC 44 Championship Tour 2008, a series of six international yachting regattas, starting with the Dubai RC44 Cup, to be held at Dubai International Marine Club. DHL's expertise will be used in the coming stages of the Tour to transport equipment for the participating teams, including boats, masts, sails and all support gear, as well as handling all the customs clearance processes necessary when transporting large volumes of specialist equipment across two continents. There is a light chop on Biscayne Bay as John Ruf checks his mainsail from the snug-fitting cockpit of his boat. With his head just visible in the low-lying boat, he jockeys for position at the start of the Rolex Miami Olympic Classes Regatta, a five-day, 15-race event. Ruf finishes the third race of the day and is exhausted. He heads the half-mile back to port. Now through Sunday, more than 175 teams across 16 one-design classes (including J/109 (left) and S2 7.9 (center)) throw down in Central Florida. Once host to the Royal Navy and George III's summer dips, the English town of Weymouth is proud of its nautical heritage and glad of the chance to rejuvenate it with the staging of the 2012 Olympic regatta. When the Royal Navy pulled out of neighboring Portland in the 1990s it followed a trend already set by the departure of the commercial fleet from Weymouth.